Alabama’s top-ranked defense, hailed as perhaps the best of the Nick Saban era, completely shut down UW’s rushing attack (44 yards on 29 carries) and sacked Jake Browning five times. ATLANTA — Sitting at the end of the team bench near the end of the game, Washington standout defensive lineman Elijah Qualls struck up a short conversation with Reggie, a security guard in a yellow jacket. Reggie used his hands to answer: “It was just pow-pow-pow,” he said, punching the air three times. A minute later, No. 1 Alabama secured a return trip to the College Football Playoff national championship game with a 24-7 victory over the No. 4 Huskies in their national semifinal at the Peach Bowl. Component post 10247638 could not be found. Well, it wasn’t just pow-pow-pow, as many ’round here expected. So much was stacked against the Huskies here in their first CFP game, here in the heart of SEC country. Nothing down here is bigger or greater than Alabama football, and no one down here ever considered for a moment that the Huskies had a prayer of upsetting the nation’s No. 1 team. And, look, Alabama (14-0) was the superior team. No one’s going to deny that. But the No. 4 Huskies (12-2) came into the Georgia Dome expecting to give a good fight, and they did. That was the case, at least, for the UW defense, which did its part, holding the Alabama offense to 17 points and 326 yards total. But Alabama’s top-ranked defense, hailed as perhaps the best of the Nick Saban era, completely shut down UW’s rushing attack (44 yards on 29 carries) and sacked Jake Browning five times. Things started out well for the Huskies. 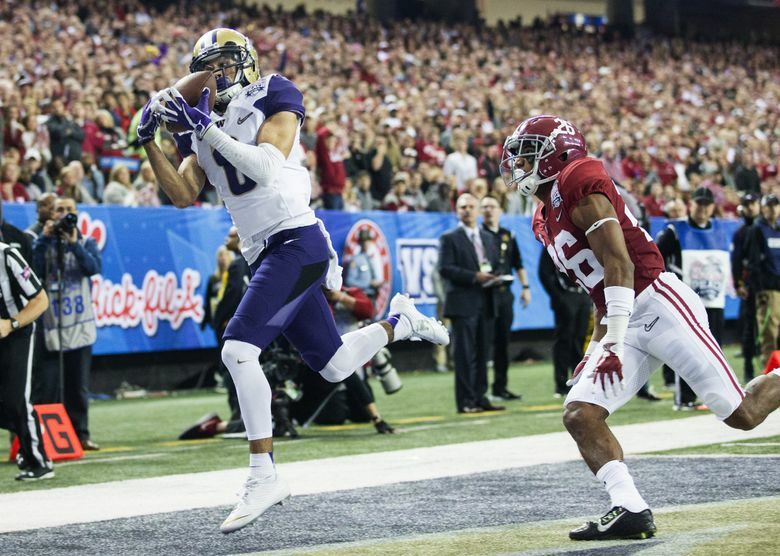 In the first quarter, Browning threw a beautifully lofted pass to the far right corner of the end zone for Dante Pettis, who had made a double move to get open for the 16-yard touchdown. That gave the Huskies a 7-0 lead seven minutes in. The offensive momentum was fleeting. 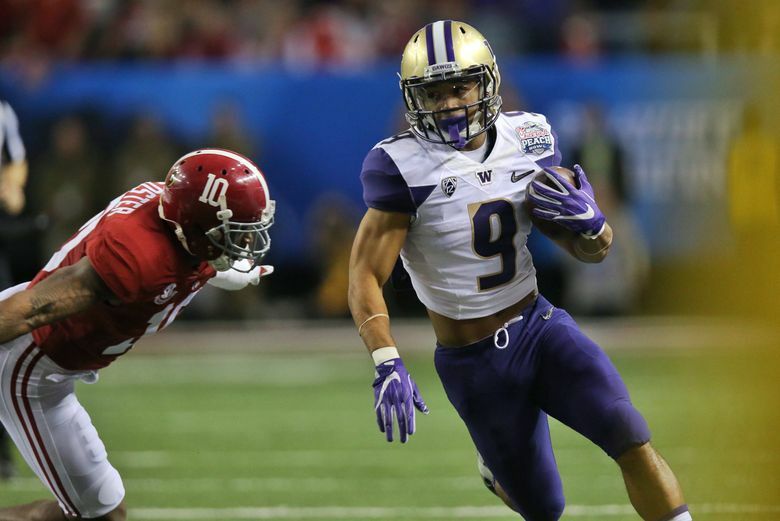 The Huskies finished with just 194 yards of total offense — just 91 in the final three quarters. They also committed three turnovers and didn’t force any on defense. Those are uncharacteristic for a UW team that came into the game leading the nation with a plus-21 turnover margin. “They beat us with our own game,” Petersen said. 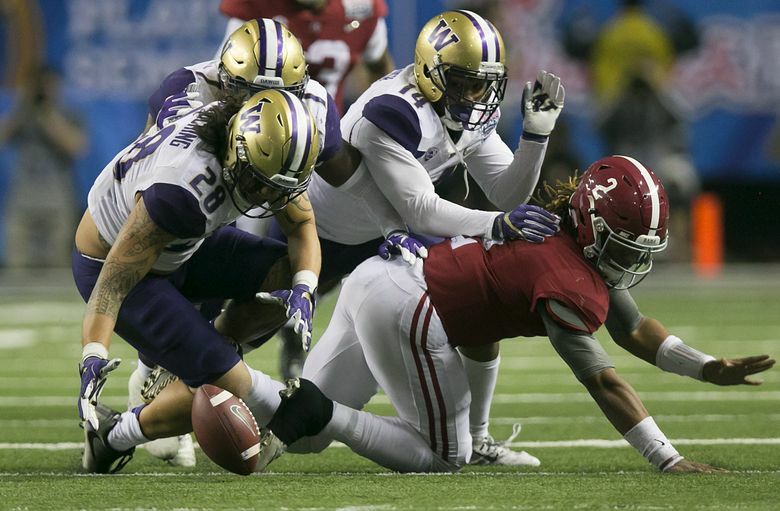 John Ross III lost a fumble that set up an Alabama field goal in the second quarter, and Alabama linebacker Ryan Anderson intercepted a short pass from Browning and returned it 26 yards for a touchdown. That came with 1:13 left in the first half, when UW had a chance to go into halftime trailing by just three points. Instead, Alabama had a 17-7 lead, which already felt insurmountable the way UW’s offense was playing. “That totally changed the momentum of the game,” said Browning, who finished 20 of 38 for 150 yards with one touchdown and two interceptions. 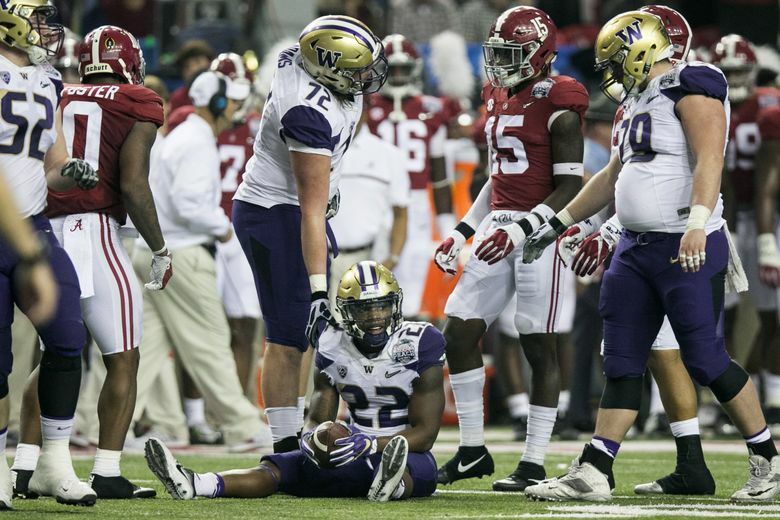 The UW defense had really only one breakdown, but it was a significant one. Alabama running back Bo Scarbrough, a 230-pound tank, broke a handful of tackles en route to a 68-yard touchdown early in the fourth quarter to extend the Tide’s lead to 24-7. Alabama fans accounted for roughly three-quarters of the 75,996 in attendance — a Georgia Dome record — and they had the place rockin’ after that run. Scarbrough was the game’s MVP with 180 yards and two touchdowns on 19 carries. “He was a monster,” Anderson said of his teammate. UW’s defense otherwise showed its mettle. All season, the Huskies believed they belonged in the conversation as one of the nation’s elite defenses, and that surely earned some respect Saturday. The defensive line — led by Qualls, Vita Vea and Greg Gaines — were stout up front. Reserves Jaylen Johnson and Damion Turpin also played well, helping the Huskies limit true-freshman QB Jalen Hurts to 57 yards on 7-of-14 passing. “I thought we played really elite defense,” Petersen said. A year ago, the Huskies ended their season by celebrating a victory in the Heart of Dallas Bowl, giving them a 7-6 record for 2015. A year later, they end with disappointment, but no regrets. They won the Pac-12 championship and became just the second team in school history to win 12 games. Washington had 14 possessions on Saturday and produced one touchdown. The Huskies committed three turnovers and punted nine times, with six possessions resulting in three-and-outs.